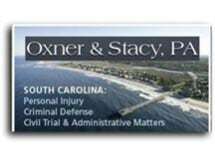 Lumpkin, Oxner & Stacy serves Georgetown, SC and the surrounding area with an additional office in Pawleys Island. They offer quality legal representation with a focus on litigation; as trial lawyers they are intimately aware of the complex nature of South Carolina law and use this knowledge to uphold the legal rights and financial interests of their clients. Skilled advocates on a variety of legal topics, they offer advice and representation on matters related to personal injury, medical malpractice, real estate law, criminal defense, business law, Social Security/Disability and Worker's Compensation. Experienced negotiators, they also have the legal & financial resources to mount jury trials against even the largest corporations and insurance companies. They maintain a broad network of legal, medical and business consultants who assist in the preparation of cases and always promise a client-focused practice, meaning that the client is always part of the decision-making process. From clients injured in car wrecks or 18-wheeler accidents to visitors looking for a real estate lawyer for the purchase of vacation property, Lumpkin, Oxner & Stacy provides comprehensive legal services with the experience and backbone you'd expect from a big city firm and the personal service and attention you get from your small-town lawyer. They are dedicated to the preservation of client rights and to the identification and achievement of client goals through consistent contact, frequent case updates and a friendly, approachable office atmosphere. In many personal injury cases, their attorneys will travel to the home or hospital to meet with clients and discuss not just their legal case but also issues related to long-term medical care and compensation for property damage. The initial consultation is always FREE, regardless of the type of case. Personal injury matters are taken on a contingency basis, meaning NO RECOVERY = NO FEE and all other practice areas offer flexible payment plans depending on the circumstances and nature of the individual case. For skilled, aggressive legal representation from respected South Carolina lawyers, contact Lumpkin, Oxner & Stacy to schedule a consultation and case review.